Every May, I pack our winter office into boxes to make the move to Eagle River. Everyone in the camp suite is ready for the summer. Oftentimes I think about jumping in the moving truck; I want to spend the summer at camp. But I stay at the JCC to serve as the liaison between our JCC and Camp. I stay in Milwaukee to be close to my husband and teenagers. I stay in the winter office to serve our camp parents, transport campers and staff to and from the airport, run bus departures and returns, and to perform other administrative duties behind the scenes. But last month, I got to go to camp. I got to go to CampMinder camp in Boulder, Colorado with other CampMinder users in our JCC. We met up with over 500 camp professionals from across the globe. 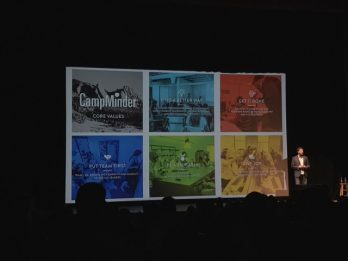 For those of you who are newer to camp, CampMinder is the platform we use to do EVERYTHING! It is our lifeline to things such as alumni management, staffing, reporting, parent communication, forms, transportation, billing and summer services. Just like we do at camp, we gathered each morning for a yummy breakfast and then headed to our chosen chugim. In my “chugim” we discussed things like the CampMinder system, Camp Culture, Leadership and mindfulness. It was a time to listen and learn inside the sessions and then share challenges and best practices with friends new and old. There were upwards of 50 sessions to choose from over the course of two days. For our “evening programs,” CampMinder hired a band and the Boulder JCC, along with The Foundation for Jewish Camp, sponsored a Jewish Camps get together. This was a wonderful opportunity to gain insight and knowledge from other Jewish Camp leaders. 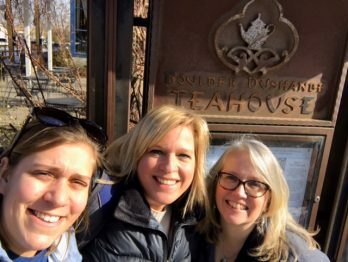 Boulder was named by Forbes Magazine as one of their “Top Secret Foodie Towns,” so lunch on our own was always an adventure for any appetite. We walked to each of our destinations with a frisson of excitement. In addition, Boulder is known for receiving high rankings in health, well-being, quality of life, education and art. When we arrived, our driver announced “Welcome to Boulder– 25 square miles surrounded by reality”. It truly is paradise at 5,400 feet. I really loved spending time with other camp professionals, while taking in the beauty and culture of Boulder. But most of all, I enjoyed learning how I can serve you, our camp families, better. To most of our camp parents, I am your first point of contact. I am the go-to person for entering a new payment method, solving travel delays and complications, scholarship questions, and technical problems with your camp account. Whether on the phone, or in person, I hope that the knowledge I gained at CampMinder Camp will make you and your camper’s experience a more positive one.